General Information: Russian Kale is yet another Brassica, but one whose leaves, rather than flower buds, are eaten. 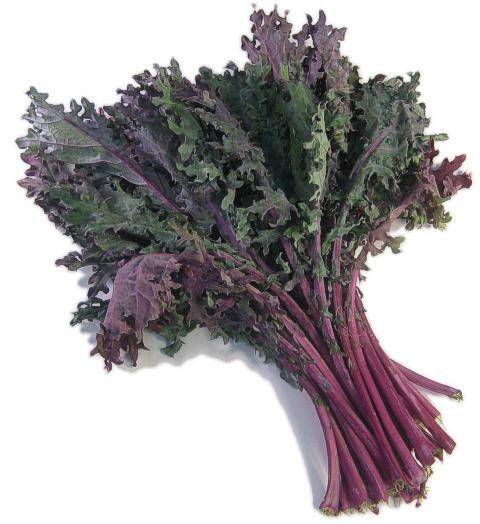 Russian Kale has a broad flat deckle-edged leaf which is softer, thinner and more tender than the leaf of Scots Kale. The flavor is a bit darker than that of Scots Kale, with stronger earth and hints of smoke. Russian Kale is generally available in two varieties, Red, as you'd expect, and Green. The green variety has some red (or purple) coloring. Applications: Kale almost always must be cooked, and cooked rather a long time. The exception might be using a bit of very finely chiffonaded Russian Kale in a salad, with the proviso that some diners may end up uncomfortable. The other exception is in juicing, where Kale mixes well with, well, whatever you want to put into a juicer. The basic rule for preparing Kale is 'discard the stems'. Here again, there are two exceptions, first, if the stems are on the tender side, they may be finely chiffonaded along with the leaf they run through, and, second, stems might be useful in making a vegetable broth. One of the nice things about Kale in general is that the leaves themselves will make a nice broth in the cooking liquid, so that if you're making a vegetable soup some Kale, helped by onion and garlic, will make the broth as you cook the soup. It's difficult to overcook Kale, so it remains recognizable even after prolonged soup making. You needn't confine it to soups, it makes a nice vegetable side steamed, and mixes well with root vegetables and with other greens such as Dandelion. It's a nice accompaniement with tomato and onion to beans (pinto, cannelini). Dried Russian Kale does a very good invegification of certain dried edible seaweeds.